The article discusses a very simple yet amusing mains operated xenon tube flasher circuit using ordinary electronic components. The circuit was taken from one of the old elektor electronics magazine and it is indeed a very cute little circuit which may be used for creating high intensity lighting effects during festivals, parties and fun gatherings. Diodes D1 and D2 along with the capacitors C1 and C2 form a voltage doubler circuit which creates a voltage level twice the value of the input voltage (across C1/C2). Resistors R4 along with R5 and P1 provides the gate current to the triac so that it can fire for the required actions. However the triac is unable to fire until the voltage reaches above the diac firing voltage which is around 60 volts (due to D3/D4). Once this happens the triac triggers, inducing a momentary pulse inside the primary winding of the pulse transformer via C3. This in turn jumps a high voltage pulse into the secondary of the transformer which is connected to the trigger wire of the xenon bulb. The xenon bulb triggers due to the above actions passing the entire voltage across C1/C2 through it. This generates a blinding arc light inside the tube, producing the required high intensity flash. The whole circuit returns to its original condition until C1/C2 charges up again and repeats the cycle. Thus the flashing keeps repeating as long as mains power stays connected at the input. As the name suggests, it's a tube filled with inert xenon gas. A metal ring is attached toward the anode side of the tube which becomes the gate trigger point of the device. This ring is terminated with a wire so that it can be connected with s pulse source. 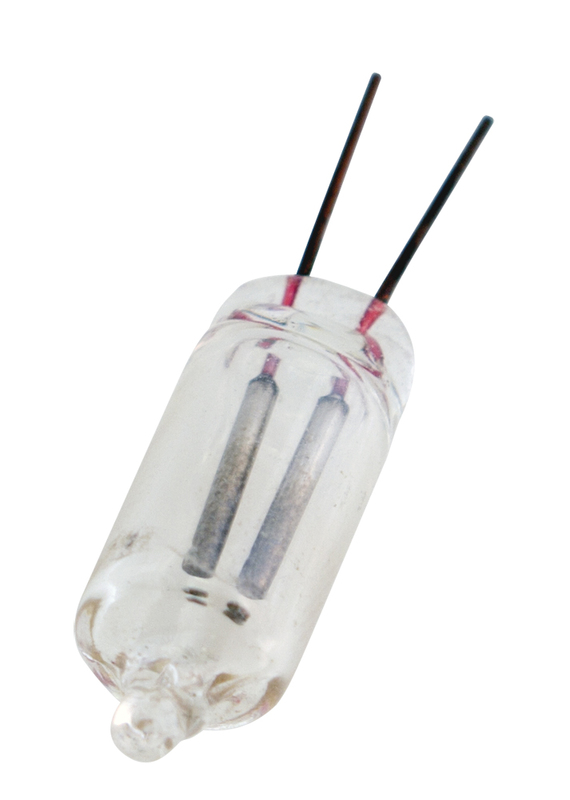 When a high voltage is set across the anode/cathode pins of the tube and a pulse applied across the trigger gate wire and cathode, the tube gets charged up and allows the whole voltage across its Anode.cathode to pass through creating an intense arc lighting inside the tube due to the passage of the high speed electrons through the xenon gas. Any standard xenon tube can be used here, preferably the ones which are used in electronic cameras. I tried with two 500 watt xenon linear tubes from a friend. but I think neither coils are not properly turned nor the transformer. Kindly help. how do I serially connect the lamps for bright flash glow? The circuit was taken from the elektor electronic magazine, so I won't be able to suggest much about the modifications. 1) try a relatively thicker wire for the secondary winding, may be a 32 SWG instead of 36. 2) Increase the values of C1/C2 to 10uF/350V. 3) Increase the value of C3 by connecting another 1uF in parallel with the existing capacitor. hi swagatam sir, I am following your posts for many days. I have found the same circuit in a bpb book, but I can not understand if i want to flash two 500 watt xenon lamp in variable rate and can control brightness, what shall be the circuit? in which brand name xenon strobes are available in india? kindly help.please e-mail me a circuit. Hi Adin, P1 can be used for adjusting the flashing rate or the speed, while the value of C3 could be changed for getting some sort of difference in the intensity of the xenon discharges. Hi Swagatam , Can I use a 1000W Xenon Lamp of Osram make for the above purpose? Hi Ankush, a 1000W xenon tube will work with the above circuit but only after the coil and the triac are modified appropriately for handling the massive power of the tube. Hi Swagatam ur blog is very useful. I need a circuit – 20 volt dc output with 500 mA.input is 230 volt ac. Hi Vijay, thanks, I'll try to design it and discuss it in my blog soon.